In 1979, I had just finished my first year at college and returned home for a summer break. Of course, my banjo, guitar and mandolin came back home with me. After walking into a nearby music store, I discovered the premier issue of a magazine called “Frets”. This was a perfect magazine for me, I thought, since I played three instruments and wanted to learn as much about playing them as possible. So I was smart enough to buy that premier issue. It’s not often that you have the first copy of a magazine that is newly published. It’s especially not often that you still have that premier issue in mint condition 32 years later. 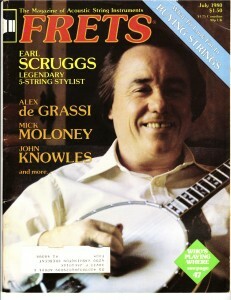 Frets was not just about banjo, mandolin and guitar. It included issues for violinists and fiddle players, bass players, dulcimer players and well; anything with a fret. Later issues featured Sting, Al Dimeola, Dan Fogelberg, Arlo Guthrie, Stephane Grapelli, Chet Atkins, Sam Bush, Ravi Shankar, Bela Fleck, Byrone Berline, Alan Munde, Willie Nelson, Albert Lee, Los Lobos, and even Itzhak Perlman to name a few. The genres were varied and included bluegrass, jazz, blues, classical and more. There were lessons, shop talk, expert columnists, history, special editions, and buyers guides. The topics, covered by experts in the field, included such themes as “Song Arrangement”, “Acoustic Music Festivals”, Reading Music”, “Buying Strings”, “Sound Recording”, “Performing”, “Learning and Teaching” and “Playing Tips”. Much of the information is still relevant today, which is one of the reasons I have maintained by collection for all of these years. There was also a luthier section that covered many topics from instrument repairs to instrument building. The care and maintenance of your instruments was addressed, as well as reviews of vintage instruments. This was an encyclopedia of musical knowledge for the acoustic musician. It included lessons from well respected instructors Alan Munde, Byron Berline, David Grisman, and Happy Traum. Upright bass was taught by Ron Carter and of course, Bill Keith wrote many columns on music theory. Other Shop experts, such as Roger Siminoff and James Rickard talked about everything from “Banjo Tone Bars” to “Acoustructure – Instrument Endurance Tests”. Each month was a treasure trove of information. So whatever happened to Frets? 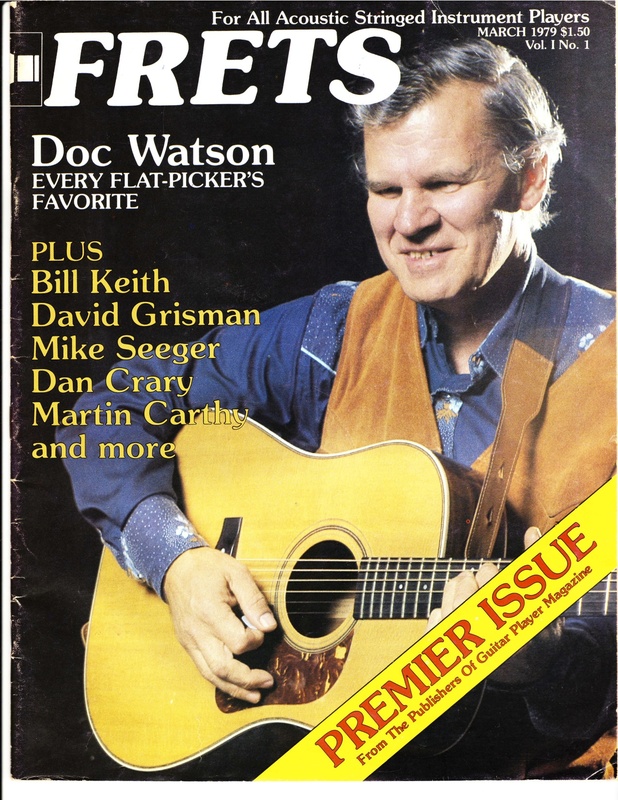 You would think that such a fine magazine should have survived and thrived in today’s acoustic music scene. The new performing artists of today should be the new feature covers and the topics could be further updated from yesterday’s news. I guess the profit for the publisher was just not there but the interest from its readers still is today, as noted on music forums concerning this topic. The magazine was owned by Guitar Player magazine and was a descendant of a earlier 1970s magazine entitled “Pickin”. The first issue was Volume I No I in March 1979 and the final issue was Volume 11 No 11 in August 1989. There were 114 issues in total, published from 1979 through 1989. This magazine is loaded with so much useful information, that I have maintained my copies in my personal library and often refer to them. While I have an entire collection of the 114 issues that I will never part with, I have placed extra copies up for sale on my website www.fretmentor.com. Since the magazine is no longer available, each copy is a collector’s item for music students, players, and fans of the monthly featured artist. You can find a gallery of the copies available at the Fretmentor Store. So while I wonder what happened to my “Frets”, maybe one day, they’ll bring it back. In the meantime, I will be thumbing through my issues from 1979 to 1989 and reliving some fond memories of some great players. 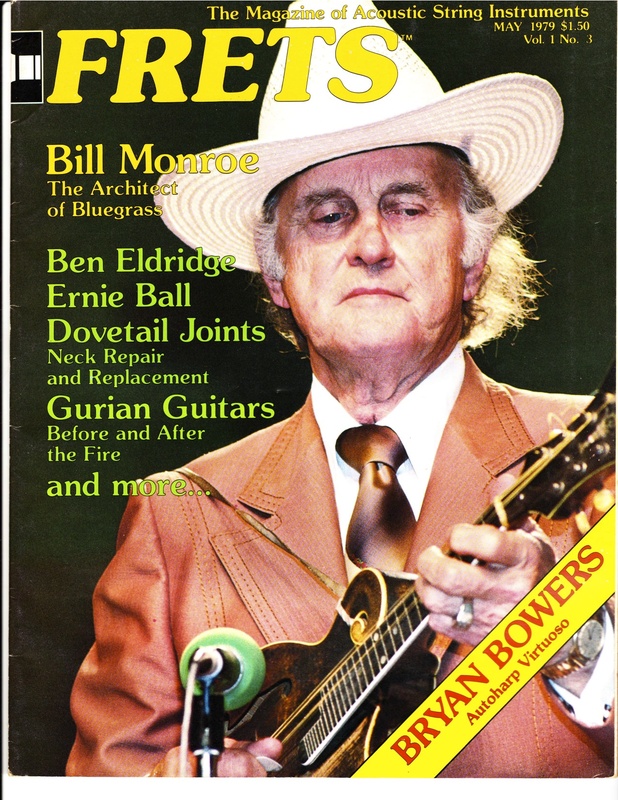 This entry was posted in Banjo, Fiddle, Guitar, History, Mandolin, Music Theory, Uncategorized and tagged Acoustic Music Festivals, Al Dimeola, Alan Munde, Albert Lee, Arlo Guthrie, Banjo, banjo lesson, banjo magazine, banjo players, banjo publication, Bela Fleck, Bill Keith, Bill Monroe, bluegrass festival, Buying Strings, Byron Berline, Chet Atkins, Dan Fogelbery, David Grisman, Doc Watson, earl scruggs, F Style Mandolin, frets, frets magazine, fretted instruments, Guitar, guitar lesson, guitar players, Happy Traum, history of performers, Itzhak Perman, Learning and Teaching Music, Los Lobos, luthiers, mandolin lesson, mandolin players, music instruction, music lessons, music pioneers, Music Playing Tips, music teacher, Music Theory, Performing, Ravi Shankar, Reading Music, Ron Carter, Sam Bush, Song Arrangement, Sound Recording, Stephane Grapelli, Willie Nelso. Bookmark the permalink. 3 Responses to What Happened To My Frets? 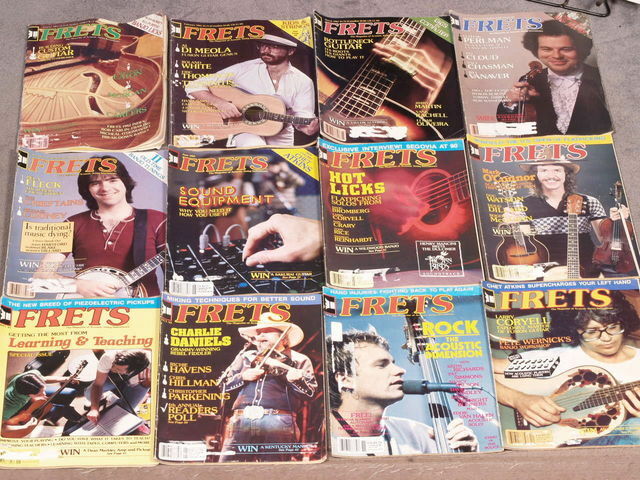 Where can I sell my mint copy of Frets Premier Issue? Speaking of frets, I brought my guitar to the Martin Guitar Company in Nazzerath Pa. on the 24th of June. To have new frets and to ajust the action, I received the guitar yesterday the 24th of October. My count of total issues from March 1979 to August 1989 is 126 issues, not 114.